In today’s digital economy, companies are competing for customers like never before as price and product are no longer the only drivers of business. The value of delivering an engaging customer experience is on the rise, and businesses are increasingly turning to software and digitized processes to accommodate this trend. In fact, 80 percent of businesses are either planning or formally engaged in digital transformation initiatives to improve their overall customer experience. Contract management is an area that is ripe for innovation and digital transformation. Often contracting processes are bureaucratic, burdensome, and a major source of delays. Yet new technological solutions are emerging quickly, affording the opportunity for AI to manage much of the process, while freeing up people—contract management staff—to focus on more strategic tasks. Are you prepared for the pace of change? -The essential documents and contracts to automate. -Driving compliance across departments and increasing collaboration. -Boosting efficiency by reducing errors with key AI technology and Machine Learning. Automating the creation and distribution of your most commonly used and highest-value documents can help teams across your company achieve greater speed and efficiency, deliver a better customer experience, and improve business operations without additional resources or expense. 1. Discuss the importance of Digital Document Transformation. 2. Hear more use cases for Conga Composer and Conga Collaborate. 3. Start transforming your processes to generate more revenue and create business-critical efficiencies. Effective contract management has many quantifiable benefits for companies. The return on investment can be remarkable, appearing on many levels across various departments. At Conga we understand the importance of getting contract management right and we believe that all successful deployments share a common journey. Let us show you how your business can realize it’s full potential by understanding and managing your current and future contracts. The end of the fiscal year is always a mad rush of activity as department heads hurry to push through projects, spend remaining budget, and finalize contracts before the year closes. Sales, procurement, and legal teams usually feel the brunt of the pressure, as they battle timewasting manual processes and piles of paperwork to squeeze in priority projects and revenue opportunities in under the wire. Join Conga and Statera for a discussion about contract management pain points and best practices to remedy those pitfalls and put you on a path to efficiency for 2019. For our 3-part webinar series on Digital Transformation, we will focus on insights for key stakeholders in your organization: Legal, Sales & IT. For our 3-part webinar series on Digital Tranformation, we will focus on insights for key stakeholders in your organization: Legal, Sales & IT. Join us to learn how to get the most out of your time at Dreamforce! With 200,000+ attendees, 3,000+ educational sessions, and countless parties, the week can be a lot to tackle. Financial Services is built on customer service, strong client relationships and trust. However, financial professionals are spending hours each week on manual, administrative tasks that could be better spent serving their clients. Watch to learn the modern challenges faced by financial services professionals and how automation technology is disrupting the industry by shifting time from document generation to client relationships while keeping client information safe, secure and reducing human error. Hear stories from two industry experts who transformed their business processes with intelligent automation. Learn how EvolveIP puts their employees first by removing manual processes and workflows to ensure maximum productivity. By automating time consuming manual tasks, employees are now able to fully spend more time on creative problem solving to support customer success and keep developing as individuals. 1. improving workflow efficiencies will help your team complete more work in less time and standardize how the work is performed. 2. the resulting efficiencies mean more time can be devoted to pursuing other corporate goals and improving profitability. 3. automation can redefine the value placed on certain skills and create new roles that support company growth. Delinda Tinkey is a marketing tech and CRM manager who drives automation through the entire sales funnel from lead generation to client engagement. She has administered Conga solutions for almost 5 years as part of Evolve IP’s technology stack. Delinda holds certifications as an Advanced Salesforce Administrator and Marketo Expert. Many organisations struggle to efficiently manage their contracts from negotiation to completion, resulting in poor visibility, decreased compliance and control, higher risk and slow completion cycles. As a business-critical process, not only from a risk but also a revenue perspective, if your business hasn’t considered contract management as a high priority, now is the time. This webinar will discuss the need to re-evaluate your Contract Lifecycle Management practices in light of the need for digital transformation, outlining the value of CLM technology and highlighting the key capabilities of a strong CLM suite. Contract lifecycle management (CLM) software helps firms optimize business transactions by linking five essential stages. However, fewer than one in five of all CLM customers captures all the strategic values a CLM implementation can bring. We don’t want that to happen to you or your organization so we’ve put together a webinar that will highlight the best practices for professionals to follow when embarking on a CLM project. The next big thing is here! According to Forbes, 38% of enterprises are already using AI technologies, and 62% will use AI technologies by 2018. The rise of AI points a spotlight at the need for integrating intelligent technologies into our business processes -- particularly around contracts. Creating effective automation rules is a necessity, as contracts are a critical component of business but are complex to create, difficult to negotiate, time-consuming to manage, and often create bottlenecks and slow-downs. Poor contract management can lead to lost work time (or more time spent on administrative, trivial tasks), slow contract and business cycles, longer time to revenue, loss of control, and greater risk. The accumulated effect of these problems has a very real effect on your bottom line. - Optimize and prepare for contract automation in order to maximize efficiency. - Prepare for contract automation in order to maximize efficiency. - Learn what maturity is and its impact on revenue growth. - Understand why companies are implementing intelligent automation. - Realize the cost-savings and benefits of automation. Automation is coming to your world - are you ready? 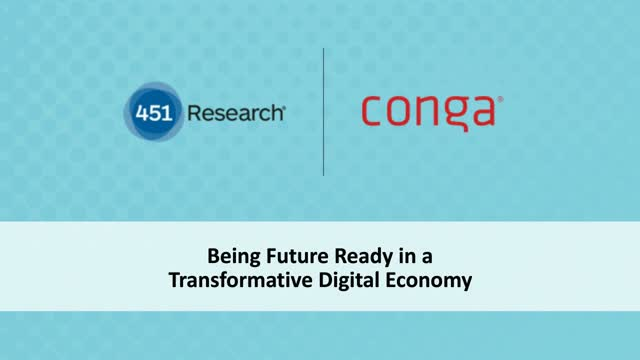 Join Doug Rybacki, Conga VP of Product Management, Marilyn Salyer, Conga Sr. Solutions Engineer, and Tim Cummins, IACCM CEO, for a discussion on tips and tricks to thrive in tomorrow's automated world. No one’s business can afford a messy signature process when revenue and important relationships are on the line. Printing, signing, scanning and uploading is inefficient and introduces potential risk your organization doesn’t need. Join our webinar to learn how Conga Sign can enhance your execution process by seamlessly integrating with Salesforce and allowing stakeholders to digitally sign documents from anywhere, at any time—no back and forth, no missed steps. It’s the final key to the true end-to-end solution you’ve been waiting for—register now! Conga helps businesses get more value from their Saleforce CRM, by automating documents and accelerating sales. The Conga Suite of products, which includes Conga Composer, the #1 paid application on the Salesforce AppExchange, increases the value of the Sales Cloud by simplifying and automating data, documents, contracts and reporting. As a Salesforce Platinum Partner, Conga has built a base of more than 550,000 users, in 45+ countries, across all industries. Thousands of organizations rely on Conga daily to manage and simplify critical business processes.